My e-mail address is rdickey@gannett.com. I promise you will be heard and receive a timely response. Led by the Pensacola News Journal, Florida newspapers have won an important legal victory protecting them from lawsuits challenging accurate reporting that might cast someone in a bad light. Wasn’t this the lawsuit that landed then-Publisher Denise Ivey in Corporate’s doghouse, before she was briefly liberated by now-retired newspaper division chief Sue Clark-Johnson? Ivey, publisher of The Courier-Journal in Louisville, Ky., is reportedly now back in Pensacola as a consultant — a victim of June’s Friday Afternoon Massacre. As Corporate reportedly burns up pricey jet fuel on jaunts to island getaways, mileage reimbursement rates across Gannett are soaring (hah!). 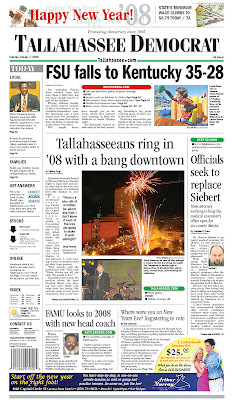 Last month, for example, the Tallahassee Democrat boosted its rate a measly two cents — to 28 cents a gallon. That’s only half the rate allowed by the IRS, which earlier this year recognized the burden higher gas prices place on workers. What’s your current mileage rate? When was it last increased? How much was the last increase? Whoo-hoo: It’s single-copy price increase day! Today’s e-mail brings reports of 50% hikes at the Tallahassee Democrat and the Rochester Democrat and Chronicle — two papers among the reported 20 papers scheduling such hikes. The Montgomery Advertiser in Alabama’s state capital might be the new poster child for the harm done to basic watchdog journalism by Gannett’s newsroom cost cutting. As near as I can tell, the Advertiser has been relying more or less exclusively on the Associated Press to handle coverage of the state legislature since lawmakers started the current session in early February. Again, this is the state capital‘s daily newspaper. 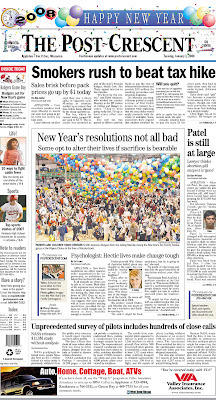 One of my readers says the paper’s legislative reporter left last fall, and was not replaced. I asked top Editor Wanda Lloyd in an e-mail whether this was true. She replied: “We’ve hired someone to cover state government and he’s starting in two weeks.” She declined to be more specific when I pressed for details. The idea that a state capital paper would outsource all its legislative coverage to the AP would have been unimaginable only a few years ago. It would have been deemed an abdication of fundamental responsibility for watchdog reporting: Keeping an eye on government to make sure elected leaders do their job and don’t abuse power. Gannett papers in the seats of power, state capitals, carry an extra responsibility in this regard. That means cities including Phoenix, Tallahassee, Indianapolis, Nashville — and Montgomery. There’s nothing inherently wrong with AP stories about Alabama state lawmakers — except that you can now get that stuff all over, courtesy of the Internet. What incentive do readers have to go to the Advertiser for state government coverage? What message is Gannett sending to Montgomery readers once accustomed to some of the nation’s best journalism? When Gannett bought the Advertiser in 1995, the paper had won three Pulitzer Prizes. The second, in 1970, was for “reports that exposed a commercial scheme in using Alabama prisoners for drug experimentation.” Sounds like state government watchdog reporting at its finest. In staffing and circulation, the Advertiser is typical of many Gannett papers. Corporate says it employs 375. Daily circulation is 45,000; Sunday is 53,000. Montgomery, meanwhile, is a typical midsize American city, with about 200,000 residents. Now, I’ve taken a couple shots at Lloyd over the Advertiser‘s 11th-hour decision last year to cancel three summer internships because of budget cuts. But you know what? I’m sympathetic to Lloyd. Corporate keeps putting the squeeze on its newsrooms to do more with less. And this is one of the results. Your thoughts, in the comments section, below. Use this link to e-mail feedback, tips, snarky letters, etc. See Tipsters Anonymous Policy in the sidebar, upper right. Golly! It’s sure interesting to see Senior Vice President Phil Currie apparently authorizing a reprint of Tallahassee Democrat Executive Editor Bob Gabordi‘s remarks on further newspaper cutbacks. Has Currie cut back on the Kool-Aid? The Tallahassee Democrat and other newspapers are risking Jayson Blair-like scandals as they publish blogs and news stories by “citizen journalists” who haven’t been properly vetted, Mother Jones magazine says. A story of a community blogger shilling for Wal-Mart without disclosing her financial ties to the controversial retailer. You are currently browsing the archives for the Tallahassee category.